The ViewSonic LCD-DMA-002 is a full-motion desk mount that allows you to position your monitor freely for healthy ergonomics and increased efficiency with a complete range of height adjustment, swivel, and tilt. The desk mount comes equipped with an all-in-one desk clamp and grommet mount for flexible integration into any desk type, while easy assembly and a quick release design offer you quick and easy installation straight out of the box. A wide range of motion is offered by the desk mount’s arms to help you maintain healthy workplace ergonomics while using a dual monitor setup. This desk mount has been designed with cable management in mind so you can finally say goodbye to cable cluttered desktops for good. In addition, all packaging is recyclable and environmental friendly for a smaller carbon footprint. 2 in 1 desk mount with clamp and grommet option supports up to 24-inch monitors. 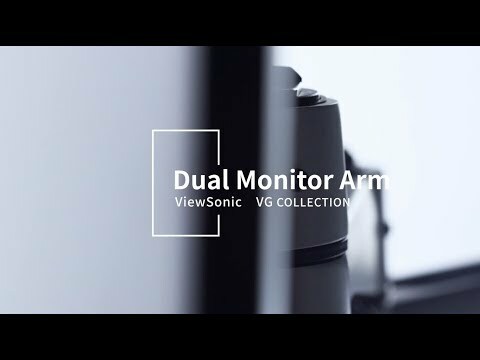 The dual monitor arm can adapt to most office desks with 75 x 75mm or 100 x 100mm monitor mount that is VESA compatible, aimed to increase workspace efficiency. The arm equipped with spring system easily adjusts monitor height with lift distance from 0 to 148mm. Both Arms can swivel 180 degrees, and pivot 360 degrees for landscape, portrait, or hybrid setup to support an ergonomically correct workstation. -15 ~ 90 degrees tilt caters to various viewing angles, anywhere from your desk. Easy assembly with no tools needed for the clamp setup; quick release design brings versatility for future add-ons. Space-saving design routes cables neatly under arm to keep clutter and cables out of sight to maintain a neat and organized desk space. The packaging used for LCD-DMA-002 is recyclable and uses paper-based packaging instead of hazardous PES (Polystyrene). The exterior of the packaging uses mono-colour printing, keeping the environment in mind.